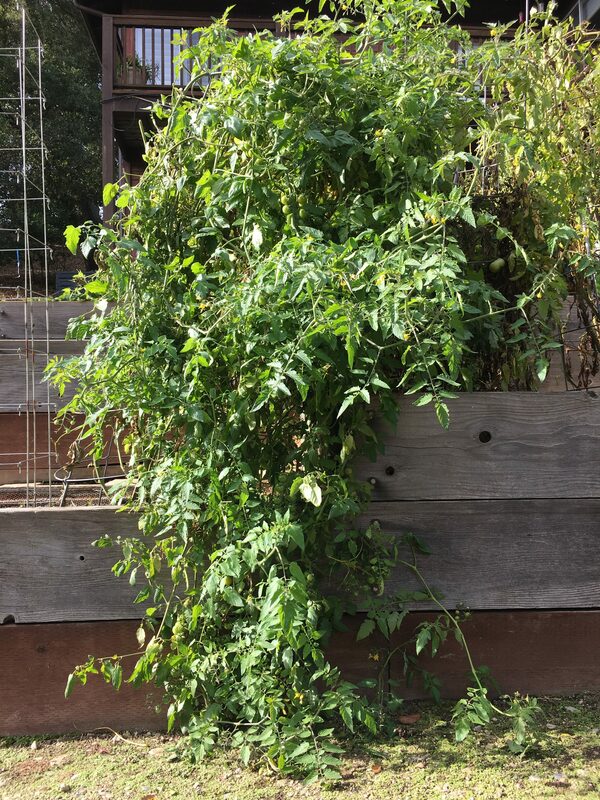 Legend of Foster - The story of a foster golden cherry tomato plant! 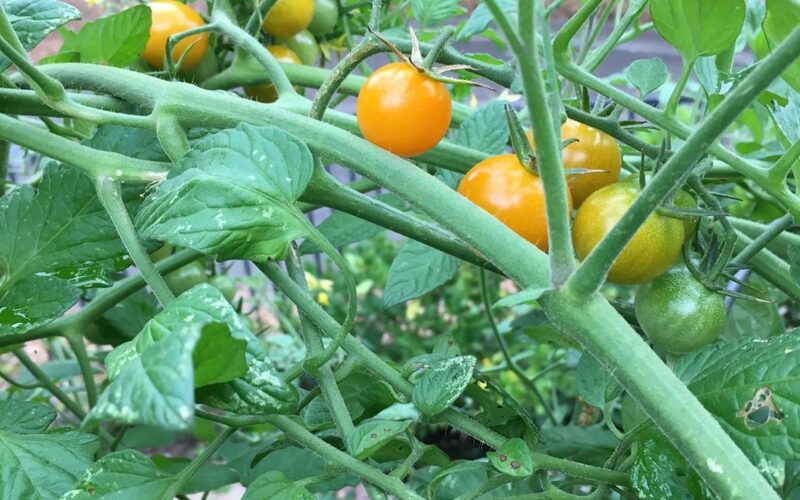 Back in the spring of 2017, a small golden cherry tomato plant asked to be fostered in my annual veggie garden. My son Mark and his girlfriend Sarah had overbought plants for their apartment garden, and the little tomato was dying a neglected death. Sure, I said, what was one more little plant among the many other veggies that we usually planted in our easterly hillside planter box garden. Mark had to nurse it back to halfway healthy before we could even attempt to transplant it. We finally placed the struggling growth in our nourishing ground and hoped for the best. I decided that Foster was a most fitting name for the little tomato plant. A week later, Foster was thriving. His trunk became sturdy, and his branches spread nicely. His improving green appearance demonstrated he was determined to catch up to his relatives next door, which had been given a head start by at least a couple of weeks. He became the first tomato to require a support cage and the first to display a bounty of flowers. I had to pinch back his side branches several times because he was infringing on the space of others. Foster didn’t care. He moved right in on the neighboring pole bean trellis, draping his arms over the growing vines. The pole beans reciprocated by winding and weaving their tentacles through and around Foster’s ever-expanding branches. My interference and trimming didn’t faze either plant. They were determined to join forces in support of each other. The same became true of the heirloom tomato plant on Foster’s other side. I decided to quit fussing so as to allow the determined growths to do what came naturally. Time passed, and Foster and his neighbors flourished. It became clear that this year’s crops had minds of their own, especially after the California winter that had blessed us with so much rain. The pole beans grew taller than they’d ever been, and Foster had no trouble keeping up. He dwarfed the other tomato plants, which were substantial in their own right. His branches were soon bursting with sweet yellow cherries, limbs now woven into the very fabric of and draping over his neighbors. Once his branches draped down to the ground, they changed course and headed back upstream. One could harvest on a daily basis. He and his pole bean friend required harvest by ladder, a first for our little garden. I was delivering a new container of cherry tomatoes to Mark almost on a daily basis. Foster stood proud of his offspring and their excellent quality. Now it’s close to Thanksgiving, and I’m ready to retire this year’s garden. But no! Foster has other plans. He’s looking weathered on the inside, but he’s still flourishing on the outside. His branches are still strong and growing, and there are still dozens of cherries to pick. I fear the colder weather will make it difficult for Foster’s offspring to ripen, so on Thanksgiving, we will pick his fruit for the last time and put him to rest. It will be sad to see him go. He was such a vital contributor to this year’s garden treasures. But I have hope that he will live on. We’re leaving a few of his offspring on the ground. Hopefully in the spring, their seeds will unfold from their winter’s rest to sprout a new generation of sweet yellow cherry tomatoes. At that point, they will no longer be fosters in my garden, but they just might move on to be fosters for others. You’re a legend, sweet Foster. It’s been a pleasure.